Nine persons were killed and 58 injured when an improvised explosive device (IED) rocked the historic Mecca Masjid on May 18, 2007. 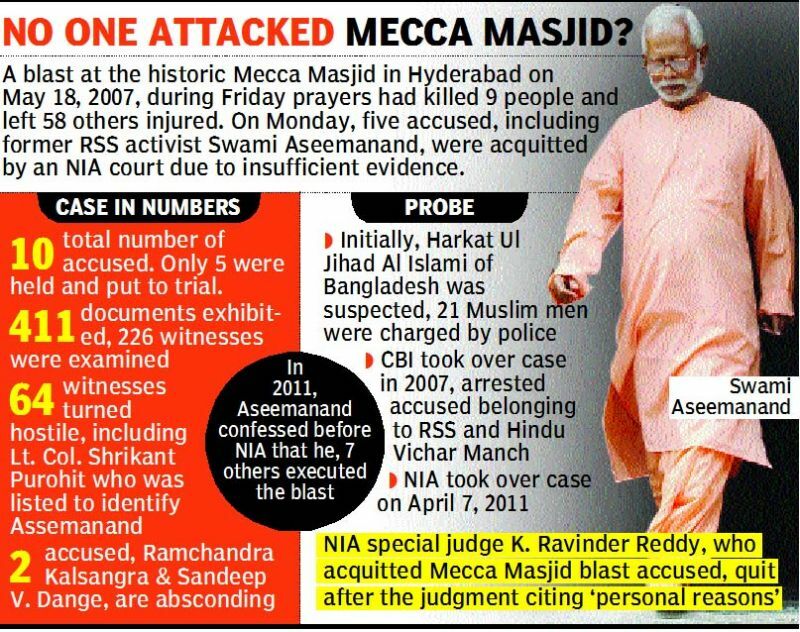 Hyderabad: Five persons, including Swami Aseemanand alias Naba Kumar Sarkar, a saffron-clad monk and former RSS activist, were acquitted in the 2007 Mecca Masjid blast by a special court of the National Investigation Agency (NIA) in Hyderabad on Monday due to lack of any clinching evidence against them. “I have carefully examined all the documents, all the material placed on record. All allegations could not be proved against any one of the accused. Hence. all persons are acquitted,” said NIA court judge K. Ravinder Reddy. In a surprise move, the judge tendered his resignation citing “personal” reasons, hours after pronouncing the judgment in which he held that the prosecution had failed to prove “even a single allegation” against the five accused. Nine persons were killed and 58 injured when an improvised explosive device (IED) rocked the historic Mecca Masjid on May 18, 2007, in Hyderabad when around 10,000 people were offering the Friday (juma) prayers. Two unexploded bombs were later recovered from the masjid. Five others were killed as police opened fire to quell the rioting mob after the blast. In all, 10 persons owing allegiance to right-wing organisations, including Abhinav Bharat, were named as accused in the case. The NIA had chargesheeted five persons — Swami Aseemanand, Devendra Gupta, Lokesh Sharma, Bharath Mohan Lal Rateshwar and Rajendra Choundary. 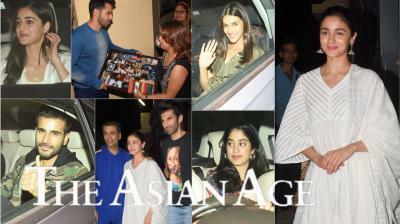 All the five were acquitted by the court on Monday. Two other accused, Sandeep V. Dange and Ramchandra Kalsangra, are absconding. Investigation against two others — Tejram Parmar and Amith Chowhan — is still on. Another accused, Sunil Joshi, an RSS functionary, was shot dead on Dec 29, 2007, in Dewas, Madhya Pradesh. While Swami Aseemanand and Mr Rateshwar, who were out on bail, came to the court on their own, Devender Gupta, Lokesh Sharma and Rajendra Choudhary were brought amidst tight security. The judgment was pronounced in a heavily guarded, closed courtroom on the ground floor of the Nampally Criminal Complex. All the five accused were present in the court when the verdict was pronounced. The NIA examined a total of 226 witnesses during the trial and 411 documents were exhibited. A total of 64 witnesses turned hostile, including Lt. Col. Shrikant Purohit, a former accused in the 2008 Malegaon blast case, who was listed to identify Swami Assemanand. Soon after the blast in May 2007, the Andhra Pradesh police suspected the involvement of Bangladesh-based terror outfit Harkat Ul Jihad Al Islami’s (HuJI) involvement and charged 21 youths. A month later, the government handed over the case to the Central Bureau of Investigation (CBI) which claimed that a Hindu terror group was behind the Mecca Masjid blast, as well as the October 11, 2007, Ajmer Dargah blast and the February 17, 2007, Samjhauta Express blast. 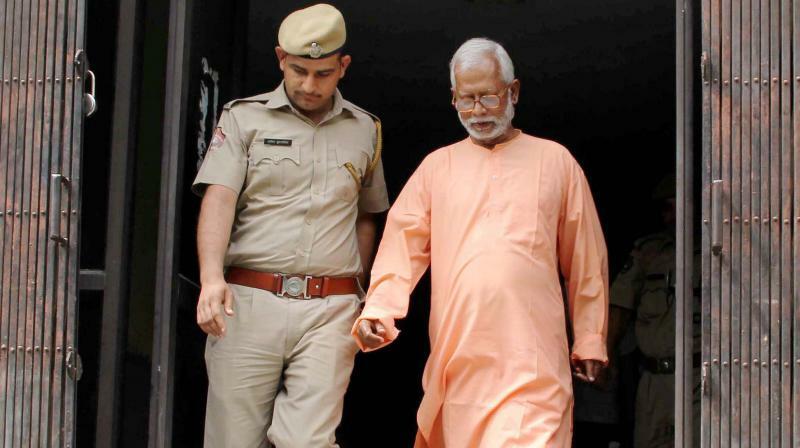 Swami Asseemanand, suspected to be an ideologue of rightwing Hindutva outfit Abhinav Bharat, was arrested from Hardwar by the CBI on November 19, 2010. He was granted conditional bail in 2017 in the Mecca Masjid case. The case was subsequently handed over to the NIA in 2011 which made some arrests and filed a chargesheet. While the NIA probe was on, Swami Aseemanand gave a signed declaration that he and seven other members of Abhinav Bharat had carried out the blast. Investigators identified Abhinav Bharat as the right-wing extremist organisation allegedly involved in the 2008 Malegaon and the 2007 Ajmer blasts. It was described as a closed group of Hindu radicals who believe in “bomb-for-a-bomb” ideology to counter jihadi terror attacks. Sources in the NIA said that they are yet to decide about appeal against the verdict in a higher court. “The decision is to be taken at the headquarters’ level. We are awaiting a copy of the judgment copy and will forward it to the New Delhi headquarters for legal advice and permission,” an official said. The police had made elaborate security arrangements outside the court premises and in the city. Roads leading to the courts were barricaded and armed policemen were posted around the court. After the acquittal of the accused, AIMIM president Asaduddin Owaisi said that the case had not been pursued properly by the anti-terror investigative agency NIA. “Most of the witnesses in the Mecca Masjid blast case had turned hostile after June 2014 and the NIA either didn’t pursue the case as was expected from it or was not allowed by its political masters to do so. Justice hasn’t been done in the case. Questions would be raised over the criminal justice system (of the country) if such biased prosecutions continue,” he said. The BJP attacked the Congress after the verdict. “For its appeasement politics, the Congress targeted and defamed Hindus and the country for merely some votes. 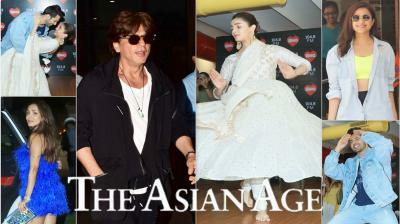 That conspiracy has been exposed,” said Sambit Patra, BJP spokesperson. The Congress countered BJP’s allegations. “There is nothing called saffron terror. It is our clear belief that terror cannot be linked to any religion or any community or caste,” said P.L. Punia, Congress spokesperson.